In case you didn’t know, today is not only Friday the 13th, an “unlucky” day in Western superstition. It is also Yom Kippur. Otherwise known as the “Day of Atonement”. A day of “love and forgiveness”, and “The day on which G-d forgives for the less desirable actions of His nation”, according to the Jerusalem Post. Which is both an ironic, and an apropos theme to carefully consider, in the light of today’s post. Ever wonder why Bernie Madoff so famously and publicly went to gaol for his ponzi crimes, when no other banker or “investment adviser” did? Take a slow, careful, thoughtful look at the list of his victims below. See anything in those names that strikes you? Harel Insurance Investments & Financial Services Ltd.
via its subsidiary Compagnie Monegasque de Banque. The chief executive of DreamWorks Animation SKG Inc.
A Jewish day school in Brookline, Mass. Meiji Yasuda Life Insurance Co.
Investment firm with offices in New York City and Menlo Park, Calif.
Money-management firm run by GMAC Chairman Ezra Merkin. Members of the Hillcrest Golf Club of St. Paul, Minn. and Oak Ridge Country Club in Hopkins, Minn. 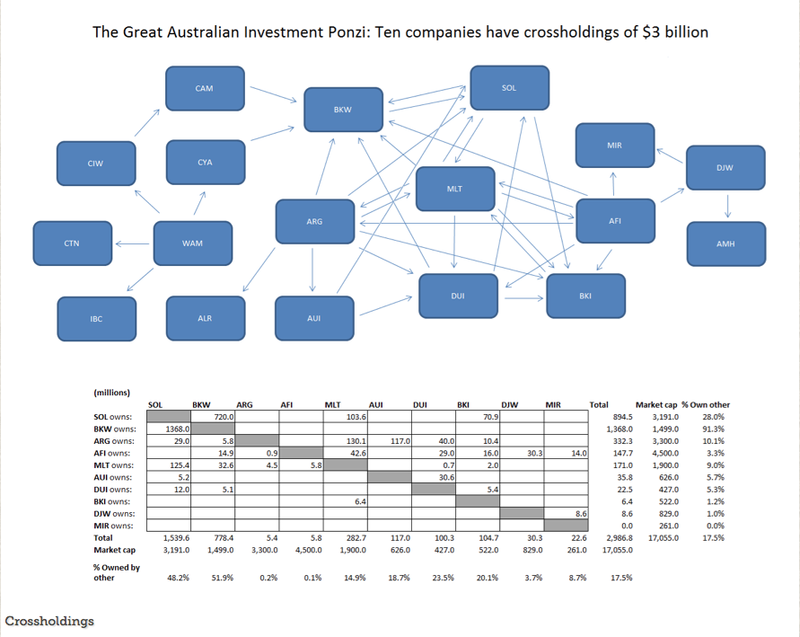 The A$16 billion Australian listed investment company (LIC) sector has become one of the largest Ponzi schemes in history, surpassed only by Bernie Madoff and MMM. For years, the dividends from the LICs have been financed by the LICs issuing shares, with the LICs thus paying their returns by seeking new investor funds. The LIC’s manipulate their share prices by buying each other and themselves, in the process creating inflated reported net tangible assets (NTA). Your humble blogger is not a shares guy, and so cannot comment on the veracity of this impressively comprehensive (85 page) presentation. Perhaps readers with more knowledge of the subject would care to analyse and comment? This is a multibillion dollar company. 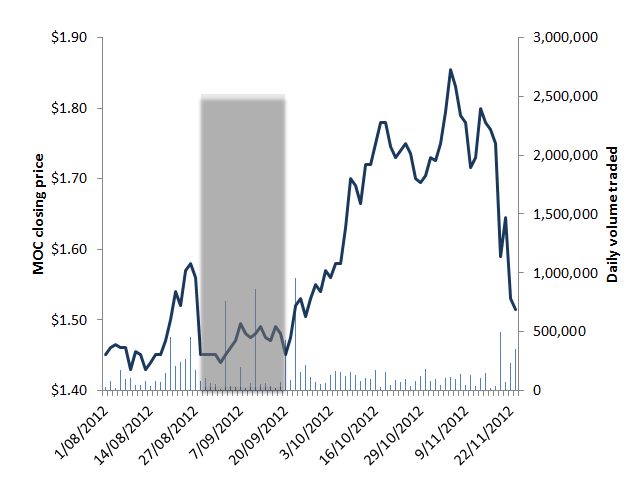 On the 29/6 at 15:58, SOL was ramped 3% by HFT algos trading 5 shares. “A cartel owns most BKW (Brickworks Limited) shares and controls the share price. The cartel openly ramps the share price after employee share plan issues, so insiders can cash out at a higher price. This is of course the very definition of insider trading. On the 3rd October, BKW issued a quarter of a million shares to employees at a consideration of $10.07. The cartel then ramped the share price 12%, to close at $11.25 on 5th October. It is clear they have given up any pretense and are now not even bothering to cover their tracks. The bankers and analysts associated with these criminals are fully aware of what is going on, with the BKW scheme alluded to in internal communications, thus leaving proof of collusion in share manipulation and insider trading. These criminals are 100% confident in ASIC’s complete incompetence and impotence. “The Australian government Future Fund recently revealed it had underreported fees, with investment fees actually totalling $1bn instead of $500m last year. The reason for this slight miscalculation of 100% was ‘non-consolidated investment vehicles’. If two investment vehicles own part of each other, and the Future Fund invests in them, part of the holdings will be charged fees twice. Sound familiar? “Most of the LICs are now manipulating their share price with algo share trading. The reason for this is simple; the cost is low, the risk of apprehension zero, and the rewards considerable. 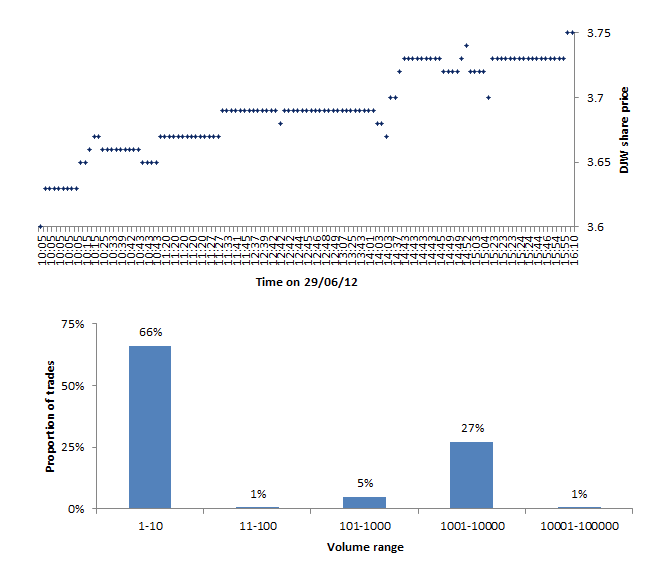 The top chart shows DJW share trades on the 29/6/12, when the price was ramped from $3.60 to $3.75. 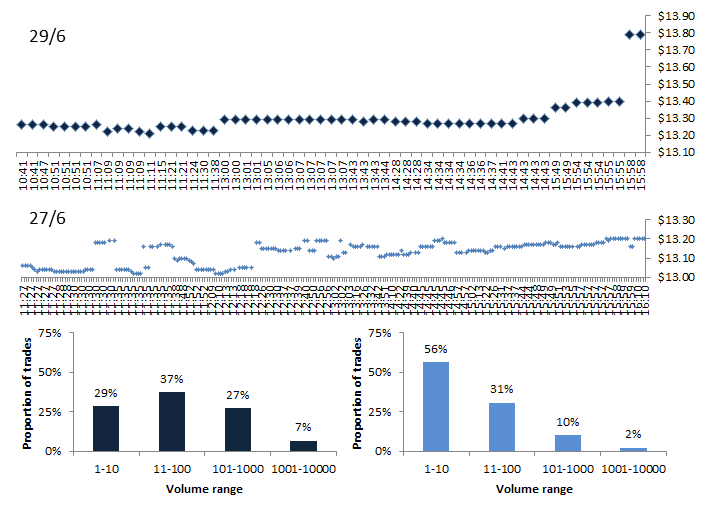 The bottom chart shows the volume distribution of trades, illustrating how two thirds of the trades were for ten shares or less. The share prices of the LICs are fraudulent, mere empty quotes put up by the managers themselves. In reality the LIC sector is insolvent and has nowhere near enough money to cash out investors. “Executive share plans can be used for ramping, as ESPs are allowed to buy the shares to be awarded to executives on-market. For thinly-traded shares or for shares with concentrated ownership, this allows the executives to ramp their own shares before they are awarded. The net effect is that insiders can off-load their shares to granny investors at a temporarily inflated price. Back to your consumer spending. Acting Prime Minister Wayne Swan says the reaffirmation of Australia’s triple-A credit rating by ratings agency Moody’s proves the economy is strong and the federal opposition is wrong to talk it down. The treasurer on Thursday also labelled as “complete rubbish” media reports suggesting the country was on the brink of an unemployment catastrophe. What else did Moody’s say? The government’s debt rating of Aaa takes into account the aim of maintaining a balanced budget, on average, over the business cycle. Without further detail, the government’s projection to reduce net debt to zero by 2020-21 is hardly believable, coming from a Treasurer who this year will chalk up his fourth huge deficit out of four budgets. It would require six consecutive annual reductions in net debt of $22bn. That is six consecutive surpluses larger in dollar terms than has been achieved previously (the largest underlying surplus was the $19.7bn achieved by the Coalition in 2007-08) or very solid growth in financial assets, which seems problematic given the likely continued financial and market volatility across the medium term. The Coalition has threatened to block any effort by the government to raise the $250 billion limit on public sector borrowing, potentially forcing the government to run out of money. “Whilst the Coalition has supported this in the past, the government should not expect a rubber stamp this time,” Mr Hockey says in his article. The Coalition demands could include scrapping the carbon tax and the mining tax, along with the benefits they are intended to finance, such as personal tax cuts and increased superannuation. Does anyone seriously believe that the Opposition would force a government shutdown, and default on our public debt obligations, rather than increase the debt ceiling? The stable ratings outlook is premised on the expectations that the government will maintain its low debt levels and macroeconomic conditions will continue to support fiscal consolidation. Any trend or event that caused a long-term shift in budget balances to significant deficits and an increasing public debt burden might put downward pressure on the rating. In other words, hope like hell that global macroeconomic conditions don’t continue over the cliff, and get back to annual budget surpluses pronto so that you can actually start paying down that “low” (but ever-rising) public debt level … or you can kiss your AAA rating goodbye. Mr Swan on Thursday also slammed a newspaper report that suggested the country was on the verge of a jobs crisis. Sydney’s Daily Telegraph reported Australia was set to lose 100,000 jobs in the months after Christmas. Not so, according to the treasurer. “Our economy has strong fundamentals, we have low unemployment, we have strong public finances, we have trend economic growth and we have a huge investment pipeline. We have “trend economic growth”, do we Wayne? Because if we do, then your budget surplus soothsaying is in very deep doo doo. Mr Swan said neither advertisers or their customers would appreciate the economy being talked down just before Christmas. Why so much concern about “talking it down”? You see, dear reader, the simple truth is this. 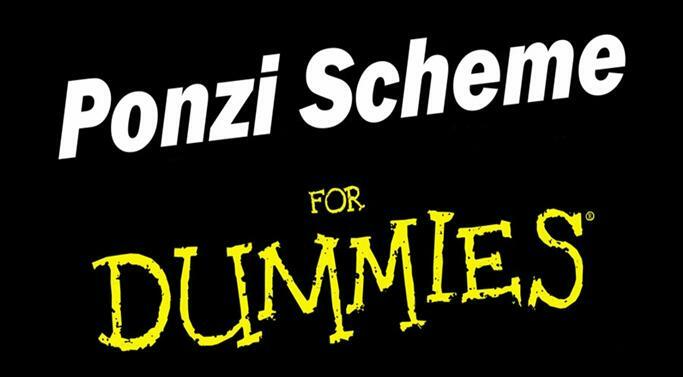 The word “economy” … in the modern, bankster-debt-driven sense … is exactly synonymous with the word “Ponzi”. Generated by lots of fools at the bottom … whose money flows to the scum at the top. Running a Ponzi is all about con-fidence. You always have to be “talking it up”. You can’t have anyone “talking it down”. Because the moment that participants in the system begin to lose con-fidence … growth slows, then stops. Horror of horrors … it goes backwards. The Ponzi begins to implode. And the parasitic scum at the top begin to lose their sole source of sustenance. Which is why the scum at the top are always so keen to … talk it up. Australia has a AAA-rated economy Ponzi. One of the last remaining AAA-rated Ponzi’s in the Western world. According to the US Federal Reserve’s Divisions of Research & Statistics and Monetary Affairs, Australia’s banking system has no monetary reserves. Abstract: This paper compares the reserve requirements of OECD countries. Reserve requirements are the minimum percentages or amounts of liabilities that depository institutions are required to keep in cash or as deposits with their central banks. To facilitate monetary policy implementation, twenty-four of the thirty OECD countries impose reserve requirements to influence their banking systems’ demand for liquidity. Note that well. Only “twenty-four of the thirty OECD countries impose reserve requirements”. Introduction: Central banks by definition are the sole issuers of “central bank money,” which consists of banknotes and deposit balances held by depository institutions at central banks. This feature provides them the power to implement monetary policy by influencing liquidity in their banking systems in order to achieve their policy (interest rate) targets and thus promote their long-term objectives. That’s very important to note. Our central bank has ultimate power over the issuance of “central bank money” – the only “money” permitted – in our nation. Discussion of which is to open Pandora’s Box, so we’ll return to that topic another day. Reserve requirements are the minimum percentages or amounts of liabilities that depository institutions are required to keep on hand in cash (vault cash) or as deposits with their central banks (required reserve balances). 4 The six countries consist of Australia, Canada, Denmark, New Zealand, Norway, and Sweden. The central banks of these six countries make interbank payment settlement accounts available to depository institutions subject to certain rules. They provide standing facilities with interest charges and the lending interest rate sets an upper bound on the market interest rate. These central banks also pay interest on end-of-day account surpluses, and that interest rate forms a lower bound on the market rate Thus, lending and deposit rates form a corridor for the target overnight interest rate. In addition to imposing rules for settlement accounts and providing standing facilities, most of these central banks influence the aggregated settlement balances in the banking systems mainly through open market operations. Here’s a flow chart helpfully provided by the researcher. 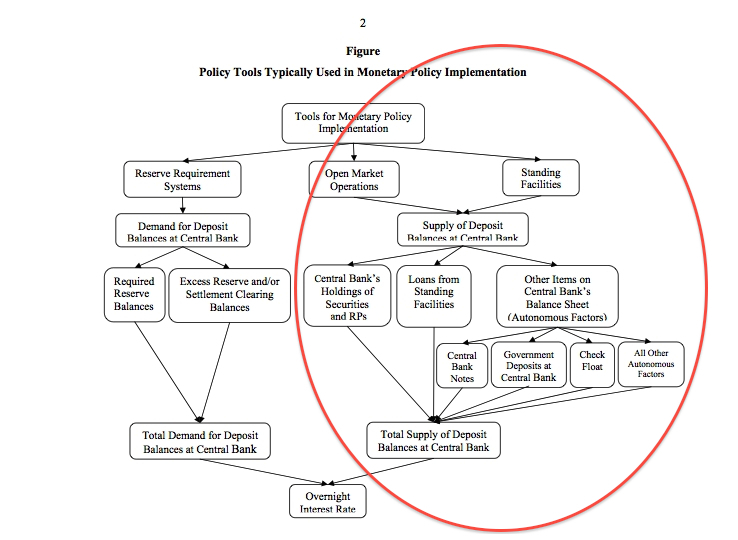 It shows (on the left) the monetary Reserve Requirement system used in 24 of 30 OECD countries. Now, it’s very important to make a clear distinction here. We need to remember that there are actually two basic concepts of what a banking “reserve” actually is. One is “monetary reserves” … that’s what the US Fed’s paper we are discussing is all about. The other is “capital reserves”. 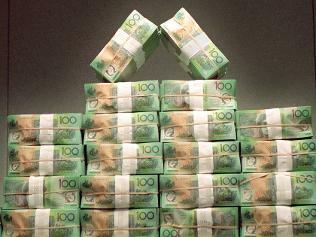 Now, Australia’s banking system does have capital reserves. It is a condition of Australia’s decision (January 2008) to adopt the Basel II Capital Adequacy framework. It is regulated in Australia by the Australian Prudential Regulation Authority (APRA), under Prudential Standard APS 110 Capital Adequacy. So if our banks have capital reserves, does that mean everything is ok? Not if you are a customer with a cash deposit in the bank. The problem here is this. Capital reserves relate to the question of the banks’ capacity to absorb investment losses. It is a kind of reserve that is meant to protect shareholders in the bank, against the bank making losses on its investments. That is why the capital reserve requirement is essentially composed of a % of shareholder funds, that are held against the value of the banks’ “risk-weighted assets”. Monetary reserves, on the other hand, relate more directly to the question of the banking system’s capacity to absorb a run on customer deposits. That is, a good old fashioned bank run, where people lose confidence in the safety of the bank/s, and try to withdraw their cash … en masse. In the twenty-four OECD countries that do have monetary Reserve Requirements, the banks are required to hold a certain amount of their customers’ cash deposits as reserves against customers’ withdrawals. In the six countries – including Australia – that have zero monetary Reserve Requirements, essentially the central bank is the ultimate backstop. If too many of us decide to go to the bank at the same time, and ask for our money on deposit – they don’t have it. This helps to explain why, during the GFC’s Peak Fear period in late 2008, the Reserve Bank of Australia had to supply billions in extra cash to our banks. The following quotation is slightly lengthy, but truly a must-read if you wish to gain a rare insight into what really went on behind the scenes during the GFC. Ian Harper, one of Australia’s leading financial economists, spent much of the weekend of October 11-12, 2008, reassuring journalists that Australian banks were safe. Harper was an expert: he had been a member of the Stan Wallis financial inquiry in the mid-1990s, which had designed the system of banking regulation. He explained that the Australian Prudential Regulation Authority already required banks to keep enough capital to cover any likely level of bad debts*. More importantly, the banking legislation provided that, if a bank failed, depositors would rank ahead of all other creditors. There was absolutely no reason for concern. But there was something about the calls Harper was getting from reporters over that weekend that worried him. “There was a whiff of panic,” he recalls. It had been building all week. He had no doubt that the government and the Reserve Bank would be able to manage a run on cash, but it might take days to arrest. Panic has been an unpredictable force in the history of banking. And the instant world of electronic banking had never been tested with a full-scale crisis of confidence. The man who had just been reassuring everyone there was nothing to worry about went down the street to the ATM and made a sizeable withdrawal to make sure his wife would have enough cash. All around the country, banks were facing unusual demands for cash. Small businesses in Queensland and Western Australia were switching their deposits from regional banks to accounts with the big four banks. An elderly woman turned up in the branch of one bank in Queensland with a suitcase and asked to withdraw her term deposits of $100,000 or more. Once filled, she took the suitcase down to the other end of the counter and asked that it be kept in the bank’s safe. A story did the rounds of the regulators about a customer who wanted to withdraw his six-figure savings. The branch manager said he did not have that quantity of cash on hand, but offered a bank cheque, which the customer accepted, apparently unaware that the cheque was no safer than the bank writing it. It was a silent run, unnoticed by the media. Across the country, at least tens and possibly hundreds of thousands of depositors were withdrawing their funds. Left unchecked, there would soon be queues in the street with police managing crowd control, as occurred in London at the Golders Green branch of Northern Rock a year earlier. “With a bank run, or any rumour of a bank run, you can’t play games with that,” says Treasury Secretary Ken Henry. The private banks keep reserves of cash distributed in 60 storerooms across the country with an average of about $35 million in each. They get topped up by the Reserve Bank before Christmas, when demand for cash typically rises by about 6 per cent, and at Easter, when there is a smaller increase. But in early October, the Reserve Bank started getting calls from the cash centres for more, especially in denominations of $50 and $100. The Reserve Bank has its own cash stash. It is coy about exactly how much it holds, but it is understood to be in the region of $4 billion to $5bn. Households pulled about $5.5bn out of their banks in the 10 weeks between US financial house Lehman Brothers going broke – the onset of the global financial crisis – and the beginning of December. That is roughly 80 tonnes of cash salted away in people’s homes. Mattress Bank is doing well, was the view at the Reserve. A year later, only $1.5bn had been put back. Think about those numbers for a moment. Households pulled “about $5.5bn out of their banks” in 10 weeks. According to the ABS, at December 2008 there were 10.916 million employed persons in Australia. So, our quiet run on the banks, a silent mass withdrawal demand amounting to a mere $504 cash per employed Aussie, was more than our banks actually had. Forcing the Reserve Bank to print up an extra $10.6bn – that’s $971 per employed person – to keep our banks liquid and able to feed the ATM’s. Really think about that for a moment. Our banks did not have enough cash money to give every employed Australian a mere $504 in cash, on demand. And yet, lemming-like, we accept their making multi-billion profits for executives and shareholders, every year. If that’s not enough to crease your brow with concern, then consider this. National Australia Bank Ltd, Westpac Banking Corp Ltd and the Reserve Bank of Australia (RBA) were all recipients of emergency funds from the US Federal Reserve during the global financial crisis, according to media reports. Data released by the Fed shows the RBA borrowed $US53 billion in 10 separate transactions during the financial crisis, which compares to the European Central Bank’s 271 transactions, according to a report in The Australian Financial Review. NAB borrowed $US4.5 billion, and a New York-based entity owned by Westpac borrowed $US1 billion, according to The Age. The RBA is all too aware of this critical danger to our financial system. The Reserve Bank of Australia has a dark worry about our banks: they get 90 per cent of their cash from each other. If one bank gets into trouble, the Australian financial system could be snap-frozen overnight. This concern was laid out by the RBA’s assistant governor for the financial system, Philip Lowe, and the chief manager of domestic markets, Jonathan Kearns, to a private RBA gathering at Kirribilli House in Sydney last week. Australia’s banks are, as the RBA governor Glenn Stevens tirelessly says, in great shape. Stockbrokers agree, even as they field the sell orders from overseas clients. “The banks are trading at 12 or 13-year lows in terms of their price-to-earnings ratios,” UBS equities strategist David Cassidy says. But it does not look that way from abroad. At a recent conference held by one of the world’s largest banks, the Australian banking system was identified as one of the best investment opportunities, for going short. The argument is that Australia’s banks hold more of their assets in mortgages than banks elsewhere and Australia’s housing is more overvalued relative to average earnings than the US housing market at its peak, or the British, Irish or Spanish markets. This will ring alarm bells for regular readers. All this was said – in a private RBA gathering – before the GFC really hit. And yet, nothing has changed regarding our banking systemic risk. We have seen previously that Australia’s banks (allegedly) hold some $2.66 Trillion in On-Balance Sheet “Assets” between them. But, 66% of those “assets” are actually loans. And the highest proportion of those loans are for mortgages. In a property market where house prices “are the most overvalued in the world” – and where those prices have just had their biggest quarterly slump in 12 years. And where arrears on mortgages have recently exceeded their GFC highs. A fall in the property market, or a rise in unemployment putting even more mortgage-holders into arrears, are real risks that could wipe out the value of the banks’ “assets” – our loans, and the “collateral” backing those loans (our houses). 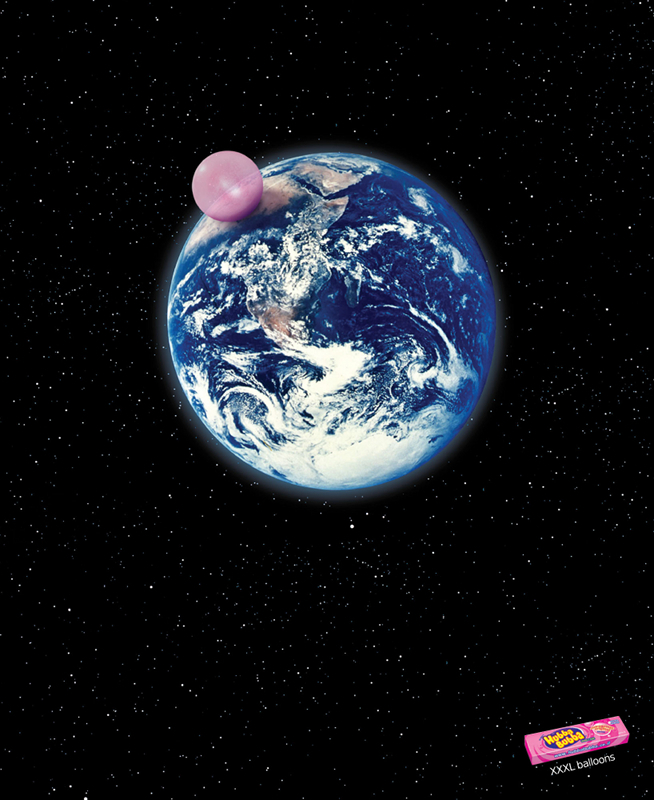 In fact, that is just what happened – very briefly – during the GFC. Mortgage arrears began to rise as the RBA kept increasing interest rates into the teeth of the storm. Our property market began to fall. Unemployment began to rise. The banks’ usual lifeblood – borrowing money from overseas to lend to Australians at a profit – had already begun to freeze up due to the dark woes abroad. And so, our banks had to borrow tens of billions from the RBA using what are called “repos” – short term cash loans from the RBA, secured against banks’ collateral. Now, some may try to argue that Australia’s banks having “capital reserves” under the Basel II banking concord means that our banks have plenty of cash, and so retail customers with bank deposits – you and me – have nothing to worry about. As we have seen, the real world events of late 2008 decry any such attempts at reassurance, as pure and utter nonsense. More tellingly, there is evidence to show that the bankers themselves do not consider their APRA-regulated “capital reserves” as being available to provide retail customers with their own cash back, in the event of a bank run. For related entities that are not APRA regulated entities it should be noted that APRA supervises the capital adequacy of a locally incorporated ADI on both a stand-alone and consolidated group basis (see AGN 110.1 – Consolidated Group, paragraph 1). 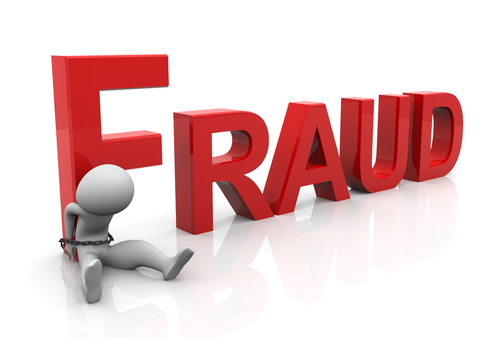 It follows that account has been taken of the ADIs related entities for the purposes of the capitalisation of the ADI. Whilst these capital reserves are not available for use in a related entity’s compensating a retail customer for loss, their mere existence mitigates the risk that the related entity within the conglomerate would lack the capacity to meet that compensation claim. It is understood that these rules do not apply to all other APRA regulated bodies suggesting that a distinction should be made in the case of ADIs by removing the requirement for a guarantee in their case. In other words, we do not want to guarantee our “related entities” against losses. And the basis for the Bankers Association argument was truly astonishing. And very revealing. In essence, their argument was that, even though capital reserves “are not available for use” in compensating retail customers for loss, “their mere existence mitigates the risk that the related entity… would lack the capacity to meet a claim”. Banking is a pea-and-thimble trick. “Our” cash, that we are led to believe is really there under the banksters’ thimble, just isn’t. The claim that Australia’s banks are “the safest in the world” is quite simply, a monstrous lie. Like all government-approved banking systems, Australia’s banking system too is nothing more than a Ponzi scheme. Backstopped by the so-called “independent” Reserve Bank of Australia. And, by the taxpayers of Australia … thanks to the Labor government’s Guarantee Scheme for Large Deposits and Wholesale Funding. Just as in the USA, UK, Ireland, Spain, and elsewhere in Europe, when our housing market collapses – taking our banks solvency with it – you already know what is going to happen. The banks will be bailed out. By our government, who will borrow the “necessary” bailout billions against ours and our children’s children’s future taxes. In the good times, banks profits are privatised – massive salaries, bonuses, perks and parties. And when it all goes bad – as every Ponzi scheme must – their losses are socialised. In my firm view, the concept of “banking” and “money” as practiced by government decree throughout the world, is arguably the greatest evil afflicting the entire human race, and impeding human progress. Banking is a vile parasite on the human host. It must be abolished, and replaced with something better. A system whereby “money” is rendered a true servant of humanity … never again to be our master. I know how this can be achieved. But that vision must wait for another day, and another post. For now, just remember the Moral of the Story today. Ignore all the “con-fidence” building reassurances spruiked to the public by our politicians, regulators, and so-called banking “experts”. An independent carbon bank, similar to the Reserve Bank, should be set up to oversee a carbon price and investment in clean technology, the peak renewable energy lobby says. The Clean Energy Council will today release a discussion paper proposing the carbon bank, which it says could be allowed to borrow money to invest in renewable energy projects against the future revenue of Labor’s proposed carbon tax and emissions trading scheme. Trading in … what you breathe out. Borrowing … and “investing” … against the future government tax revenue. In other words, the government … meaning taxpayers … the guarantor for any losses on those “investments”. The “independent” Reserve Bank is a great model to follow then. Why do we tolerate an “independent” Reserve Bank, whose first legal duty is to maintain a “stable” currency, when it is so clear that they have always utterly failed to do so. And derivatives, well, they’re safe-as-houses too. After all, the mortgage-backed derivatives market that blew up America is only a tiddling little market. 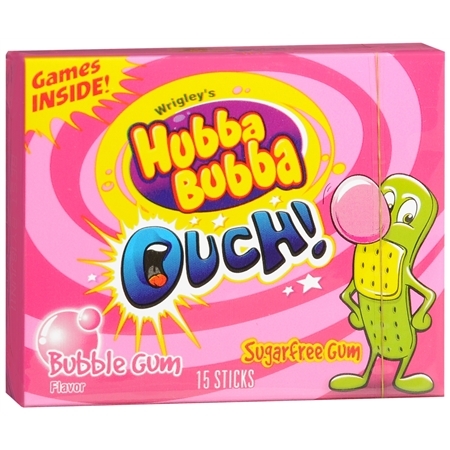 $2.66 Trillion in "Assets" versus $15 Trillion in Off-Balance Sheet "Business"
They say that the main gimmick used to promote Hubba Bubba is that it is less sticky than other brands of bubble gum, and so burst bubbles are easier to peel from your skin. Sure, we are going to get squeezed dry. 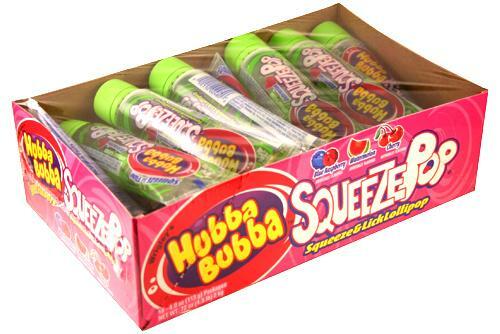 But there’ll be no needing to go shave our heads or rend our clothes when the biggest bubble ever goes POP! I wonder which flavour we will get. Warnings that Europe faces its gravest challenge since World War II and that the “contagion” from troubled states such as Greece could quickly spread have heightened anxiety in global markets after a steep plunge on Friday reversed much of the week’s gains. The optimism that followed last week’s E750 billion ($1.05 trillion) European bailout evaporated late on Friday, with markets across the continent plunging and Wall Street closing sharply lower. The euro tripped to its lowest level against the US dollar in 18 months on Friday on fears of years of weak economic growth in the 16-nation European bloc. 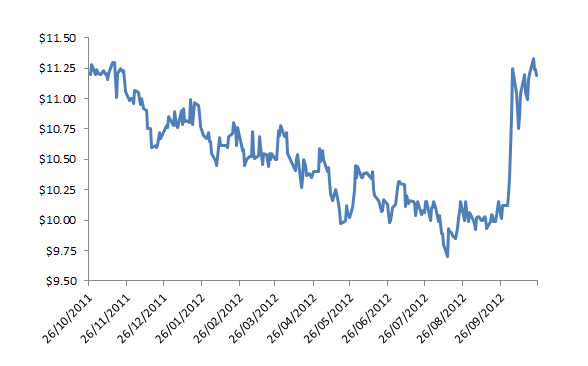 The euro is at a record low against the Australian dollar, buying just $1.3974, down from more than $2 early last year. The euro was not helped by comments by US President Barack Obama’s top economic adviser Paul Volcker, who spoke on Friday of the potential “disintegration” of the 16 nations that share the euro currency. And Paris has had to deny reports that President Nicolas Sarkozy threatened to pull France out of the euro to force German Chancellor Angela Merkel to bail out Greece. European Central Bank president Jean-Claude Trichet at the weekend called for more action by euro-zone governments to improve fiscal governance. Yesterday, Angela Merkel, German chancellor, warned that the $1 trillion rescue package had only bought Europe time, and that further steps were needed to address the differences in competitiveness and budget deficits between the member countries. In a speech to the annual German trade union conference, Merkel emphasised that speculation against the euro was only possible because of the huge differences in economic strength and the levels of debt between individual eurozone members. Meanwhile, the head of the European Central Bank, Jean-Claude Trichet, emphasised that it was urgent that eurozone countries rectify their budget deficits. He said that after the events of 2007-8, “private institutions and markets were about to collapse completely”. That triggered governments to step in with very bold and comprehensive financial support. The problem was that markets were now questioning whether some governments could afford to repay their debts. Click here for 9 simple charts that show why a collapse of the Eurozone is inevitable. The markets have begun lining up Australia’s banking system in the crosshairs. How do we know? Late last week, the spreads on credit default swaps (CDS) for Australia’s banks widened the most of all banks in the world. By the close of trading on Friday, all 4 members of our “safe as houses” 4-pillar banking system, along with our own ‘Goldman Sachs’-style investment bank Macquarie, saw deteriorations in their CDS spreads by amounts that were the worst in the world. What does that mean? Simply, the cost of taking out “insurance” against the bank defaulting on its debts increased dramatically. On average, Australian banks are sourcing just under a third of their funding from overseas wholesale markets and still too much of their existing borrowings are short term. Australian banks are among the more vulnerable plays in the world to another Lehman-style event because of their dependence on overseas wholesale markets, which have proven already they can freeze up for extended periods. But overreliance on international wholesale capital funding is far from being the only risk to our banking system. 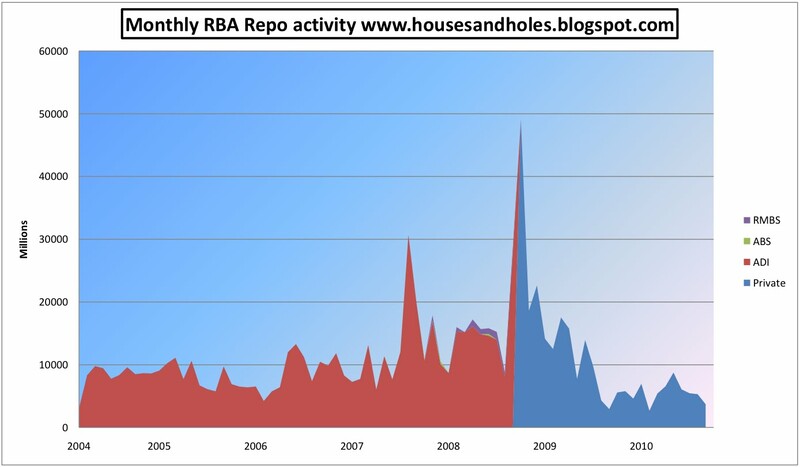 Australia’s banks also have a chronic overexposure to the domestic housing (mortgage) market. A fall in property values here – just as in the rest of the Western world – would be catastrophic for our banking system. 60% of Commonwealth’s lending books are residential mortgages. 50% of Westpac’s lending books are residential mortgages. Our banks have over $13 Trillion in off-balance sheet business. We dropped the line yesterday about the banks having $13 trillion of off-balance sheet business. We’ve mentioned this number several times over the last year, but if you’re a new reader to Money Morning, here’s a link to the Reserve Bank of Australia spreadsheet that contains the awful truth. To be precise, it currently runs to $13,058,814,195,842.70. Just to put that in perspective, the banks have a total of $2.59 trillion of on-balance sheet assets. 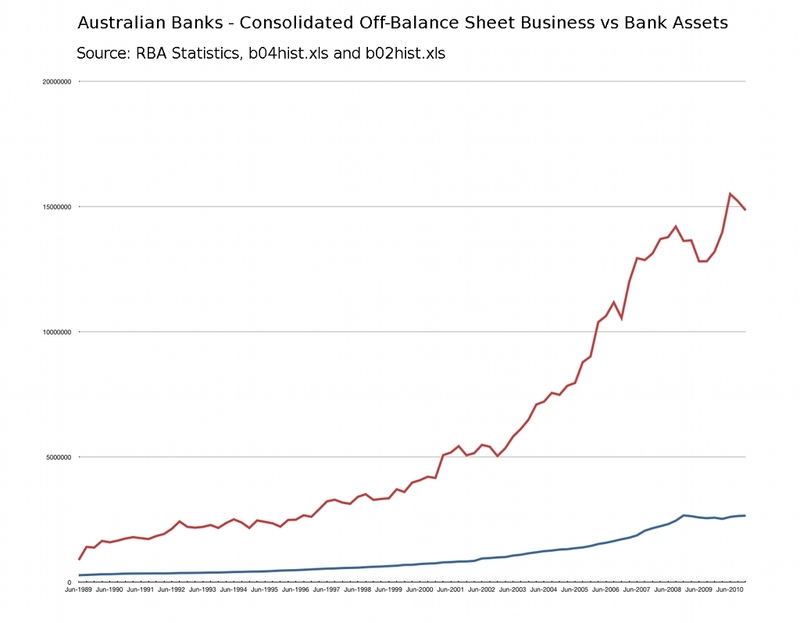 We’re sure the banks and the RBA will claim that all the off-balance sheet business is completely offset, so that losses are contained. Personally, we don’t think you should believe a word of it. The number one risk with the off-balance sheet business is counterparty risk. As long as each counterparty can keep the ponzi scheme going then sure, everything will be tickety-boo. But as we all know, that can’t happen. We’ve seen counterparties collapse before (Lehman, Bear Sterns, etc…) and they’ll collapse or need bailing out again. There’s only so long that banks can keep the ponzi going. They’ve scraped through by the skin of their teeth thanks to an unprecedented bail-out by the taxpayer. The issue of counterparty risk is precisely why the Greek debt crisis is a threat to Australia – despite what Ken Henry and Glenn Stevens would have us believe. It is clear that our Aussie banks are not so safe after all.